1. In the Home page, click the Register button. 2. Choose the icon "I am a designer". Enter your name, email address, password and contact number. 3. 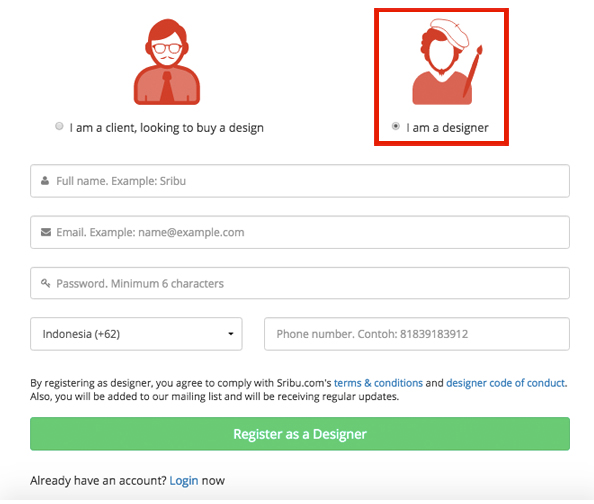 Click the "Register as a designer" button. 4. Sribu team will send a confirmation email to your registered email account. Click the link to verify your Sribu account. You may then access Sribu website pages by using your registered email acount and password. 5. Congratulations! Your Sribu account is successfully verified. Next, join the Designer Examination or test held by Sribu, followed with your profile completion.